If you know anything much about nature you will realise that baby birds generally don’t hatch out in August but I was going through my last download of Photographs and found this reminder of a wonderful experience I had with my family back in June. 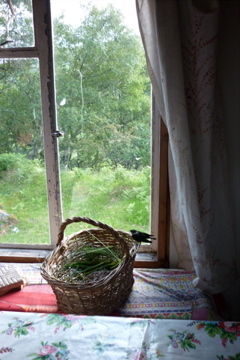 We were staying at a house in the mountains and arrived late a night to find two tiny baby swallows sheltering under the front door. We were in a bit of a dilemma as to what to do with the birds but this did not last long as we had to move them in order to enter the house! 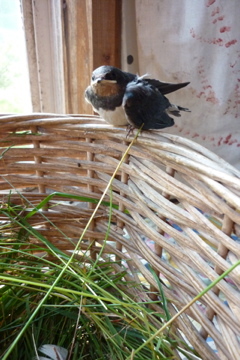 In the end, after discovering that their nest above the doorway had collapsed, we lifted them and put the two little fellows in a basket of grass! They perched on the edge of the basket all night and in the morning timidly hopped and flew in short bursts around the doorway until eventually they embarked on thier first timid flights out doors, crash landing in nettles and eventually disappearing off into the blue sky. 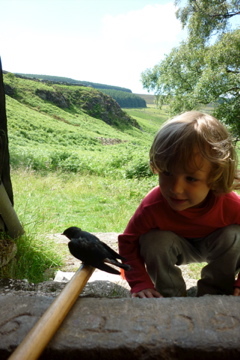 It was a privilege for us and our kids to see delicate nature close up. We hope they survived and maybe we’ll see them again next year!